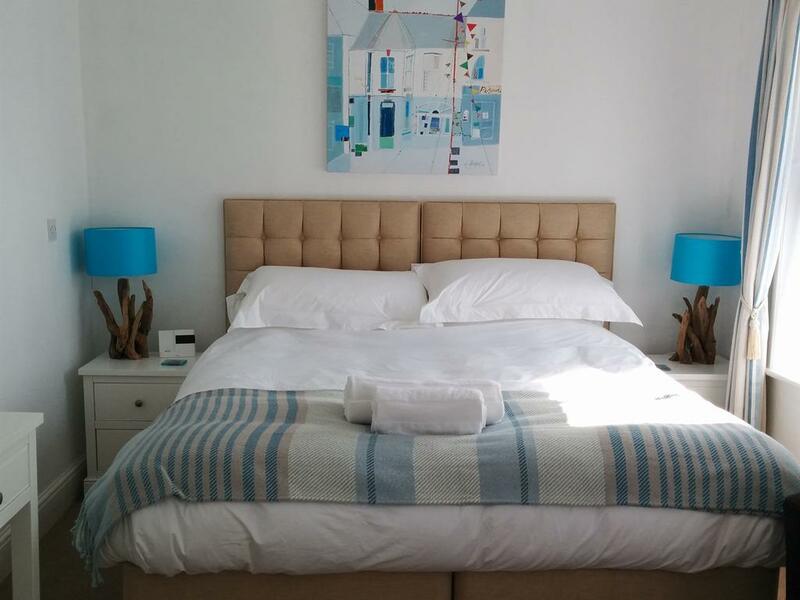 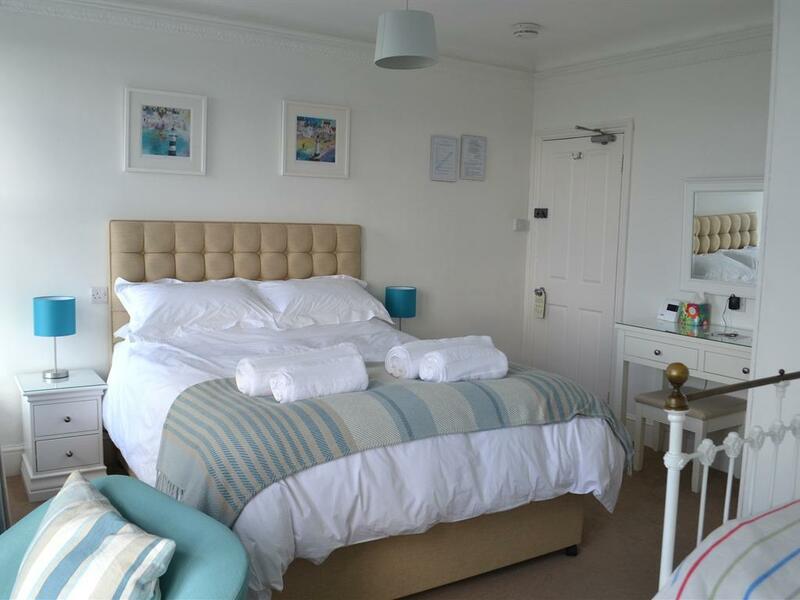 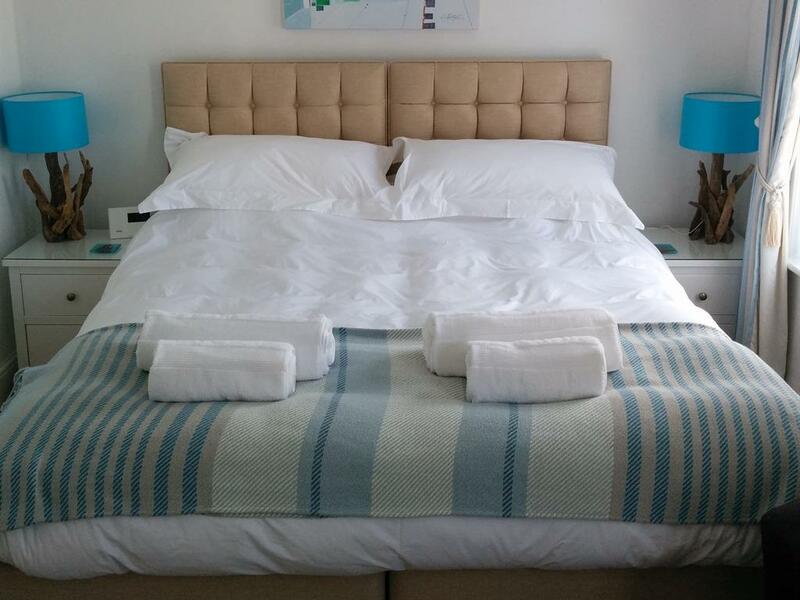 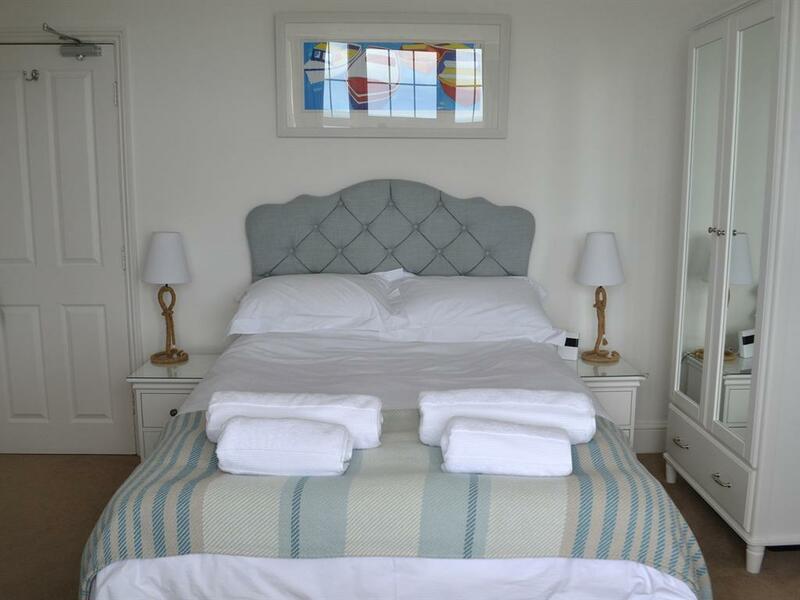 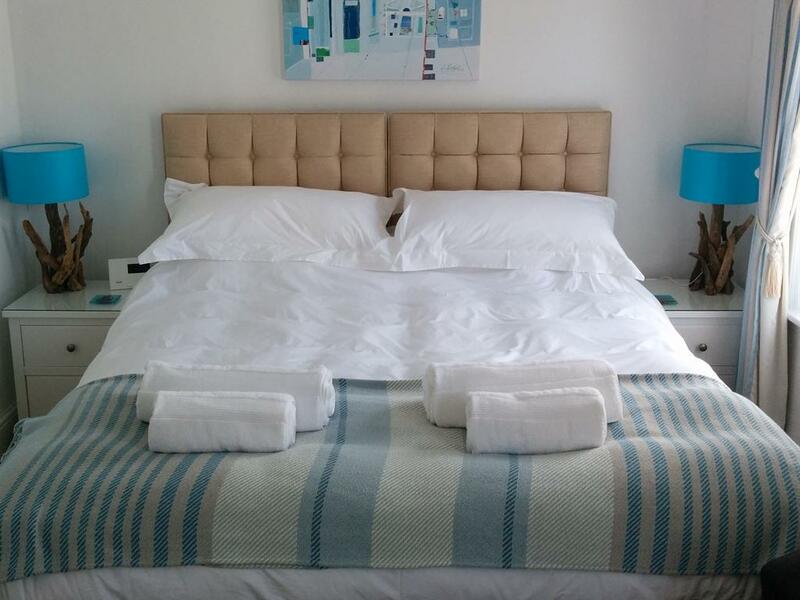 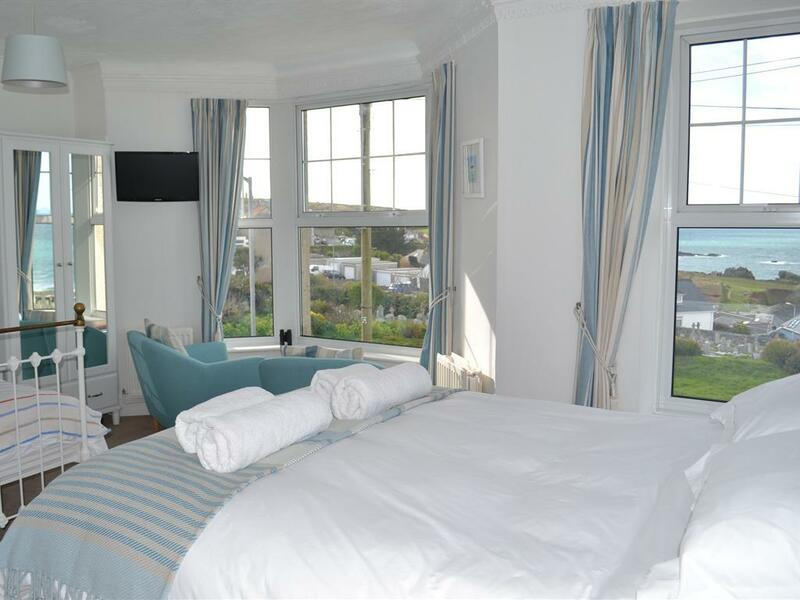 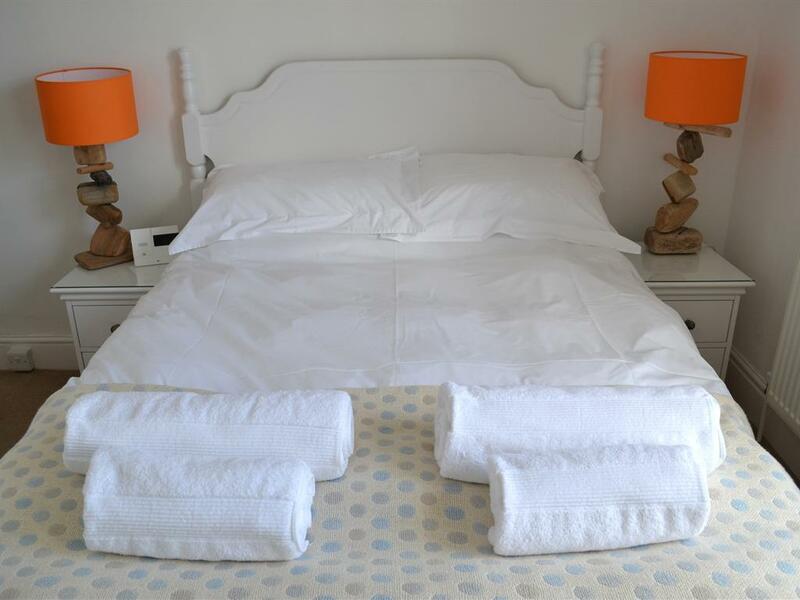 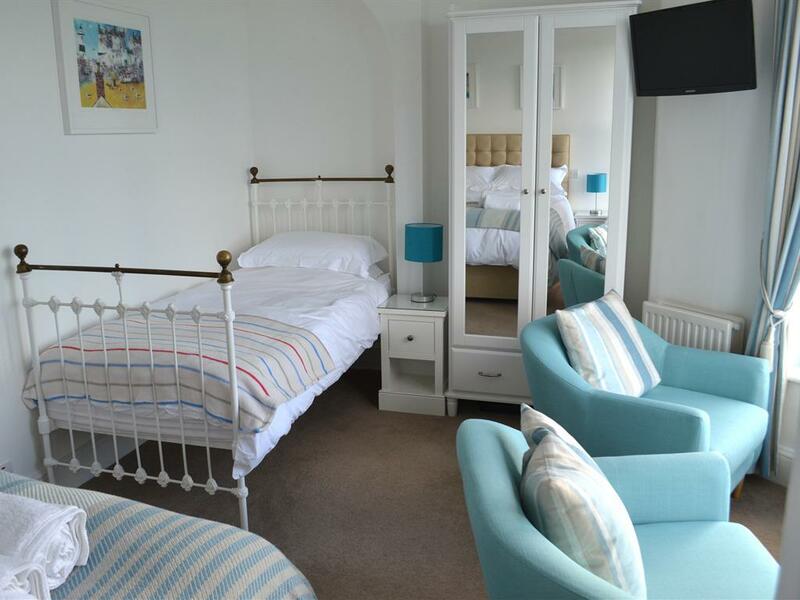 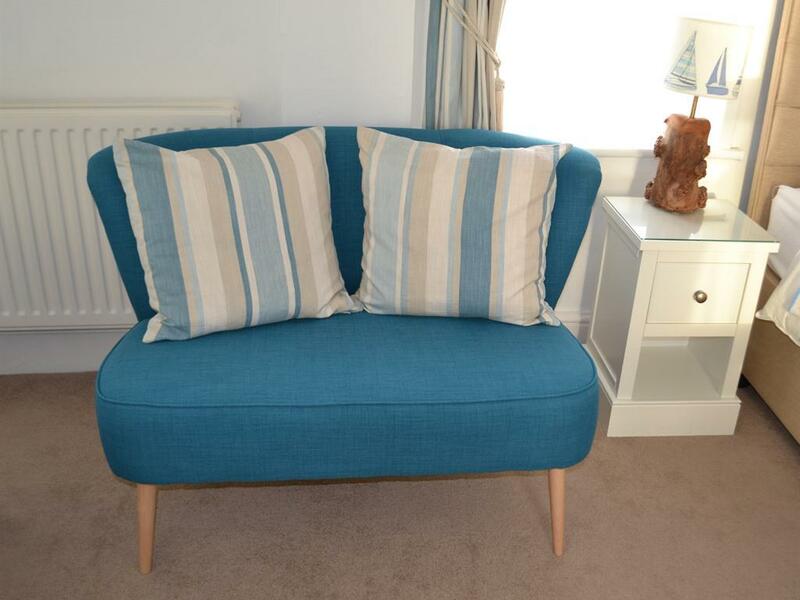 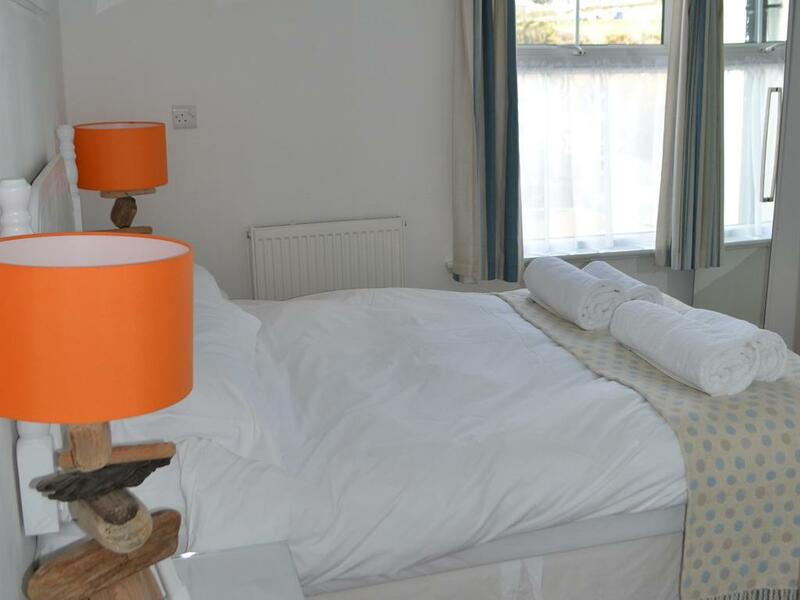 Room 5 is a comfortable double en-suite room with stunning uninterrupted views overlooking Porthmeor Beach, across to Clodgy Point and the Island. 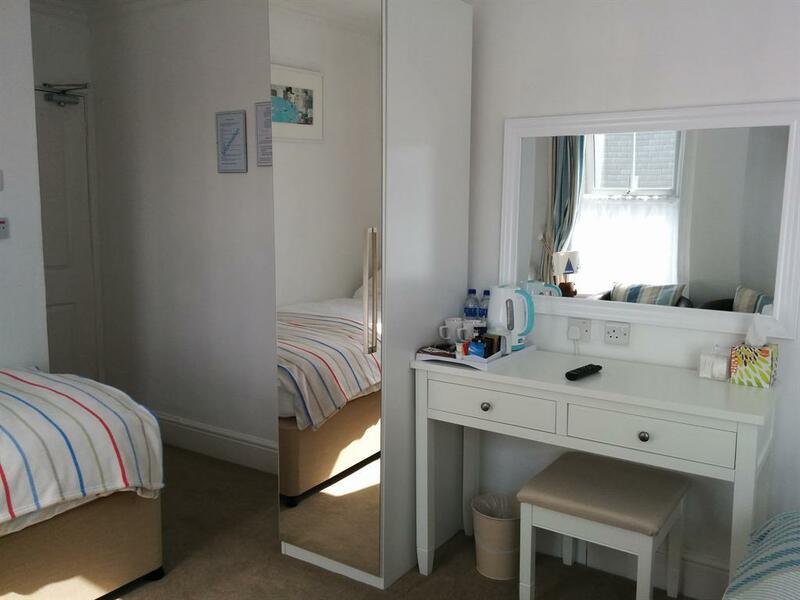 It has a double bed, ample wardrobe and drawer space. The room is equipped with flatscreen TV with Freeview, free wi-fi, tea and coffee making facilities, alarm clock/radio with i-pod dock and hairdryer. Price is inclusive of full English breakfast. 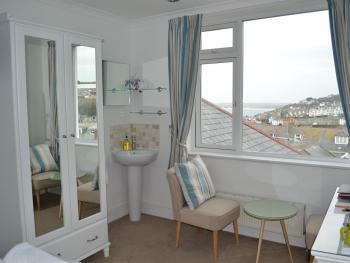 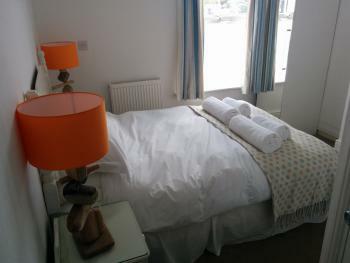 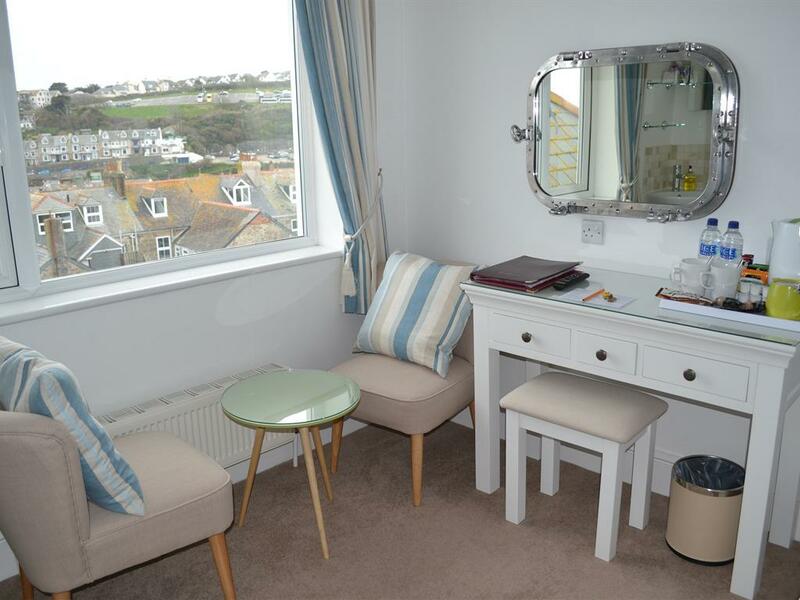 Room 2 is a small double en-suite room at the back of the property with views across to St Ives Leisure Centre. It has a double bed with ample wardrobe and drawer space. The room is equipped flatscreen TV with Freeview, free wi-fi, tea and coffee making facilities, alarm clock/radio with i-pod and hairdryer. 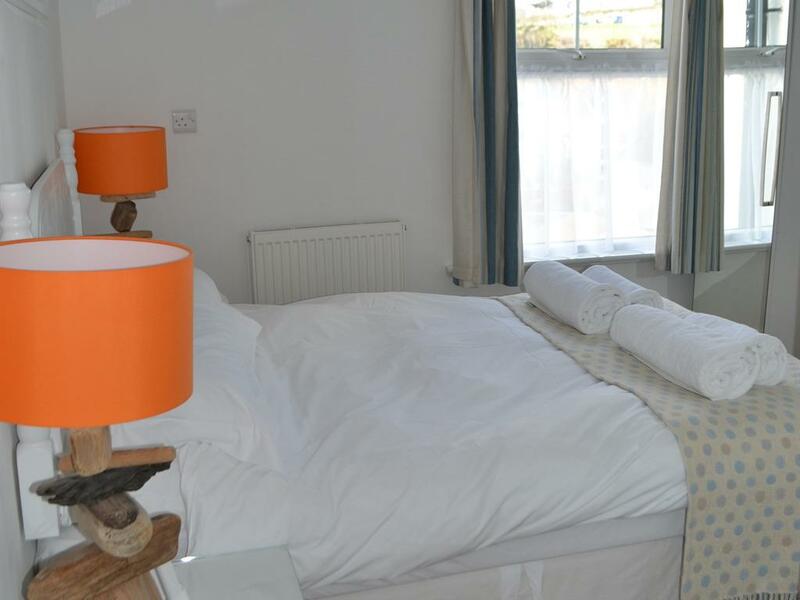 Price is inclusive of full English breakfast. 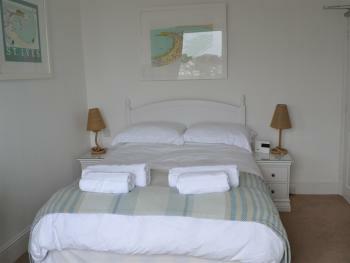 Room 4 is a well-presented double room on the top floor at the back of the property. It has a large window, which makes this room very light with the sun all day long, with great views across St Ives Bay towards Hayle Towans. It has a double bed, ample wardrobe and drawer space, flatscreen TV with Freeview, free wi-fi, tea and coffee making facilities, alarm clock/radio with i-pod dock and hairdryer. Please note: This room is NOT EN-SUITE, but has its own private lockable bathroom facilities (shower and toilet) across the landing, opposite the room, with a separate sink in the bedroom. Bathrobes are provided in the wardrobe. Price is inclusive of full English breakfast. Room 3 is a spacious family en-suite room with stunning uninterrupted views overlooking Porthmeor Beach, across to Clodgy Point and the Island. 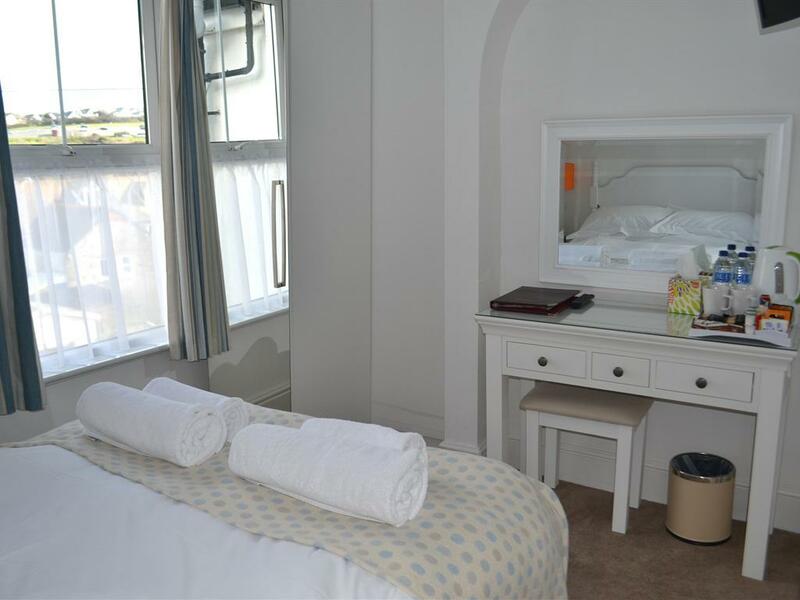 It has a king bed and a single bed with ample wardrobe and drawer space. 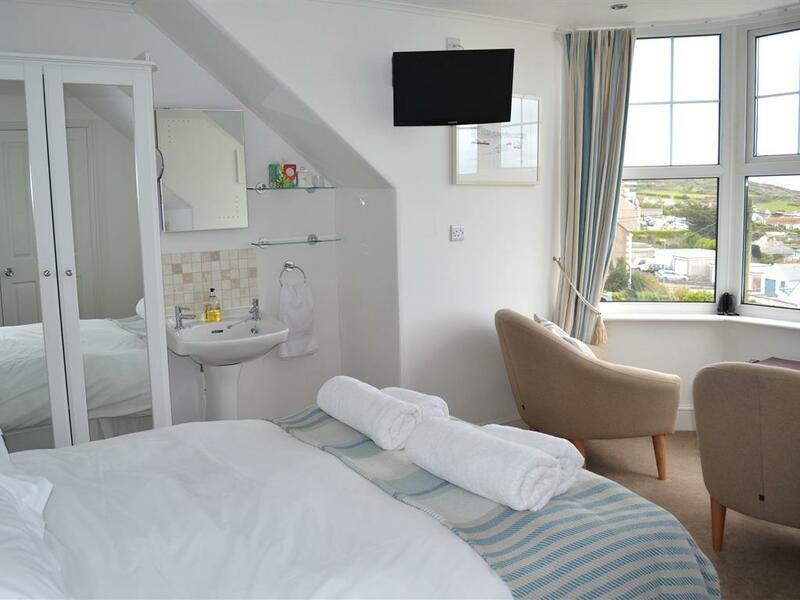 The room is equipped with a flatscreen TV with Freeview, free wi-fi, tea and coffee making facilities, alarm clock/radio with i-pod dock and hairdryer. Price is inclusive of full English breakfast. Room 1 is a spacious family en-suite room with views across to St Ives Leisure Centre. It has a superking bed and single bed with ample wardrobe and drawer space. The room is equipped with flatscreen TV with Freeview, free wi-fi, tea and coffee making facilities, alarm clock/radio with i-pod dock and hairdryer. 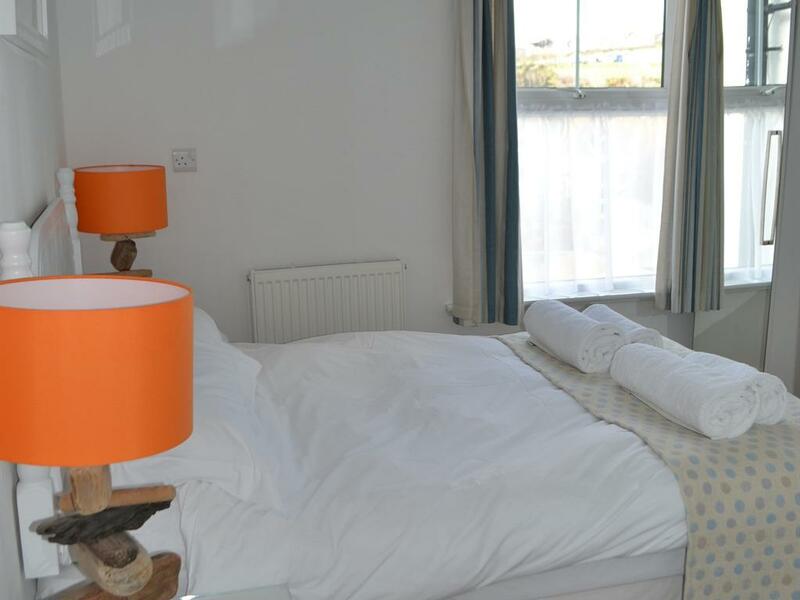 Price is inclusive of full English breakfast. 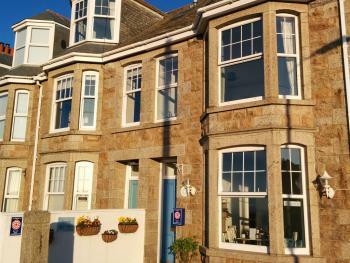 Tregony Guest House is a Visit Britain 4 Star Silver Rated accommodation in the heart of St. Ives in Cornwall. 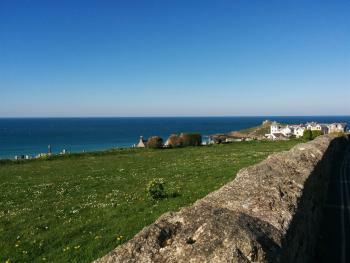 It enjoys a central location in St. Ives and boasts magnificent views overlooking Porthmeor Beach, with beautiful views of Clodgy Point and The Island. 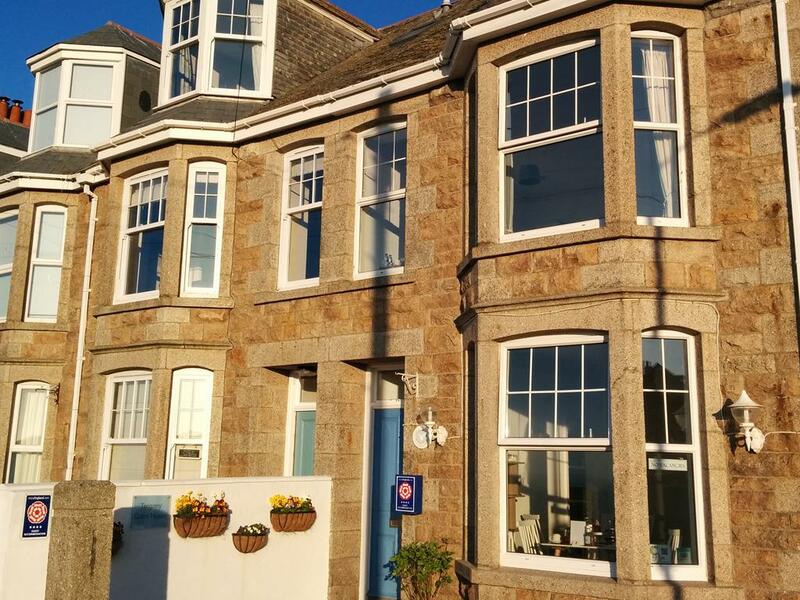 Tregony Guest House is also ideally situated close to the cobbled streets of the town centre where you can find anything in St. Ives' many quirky and specialist shops. 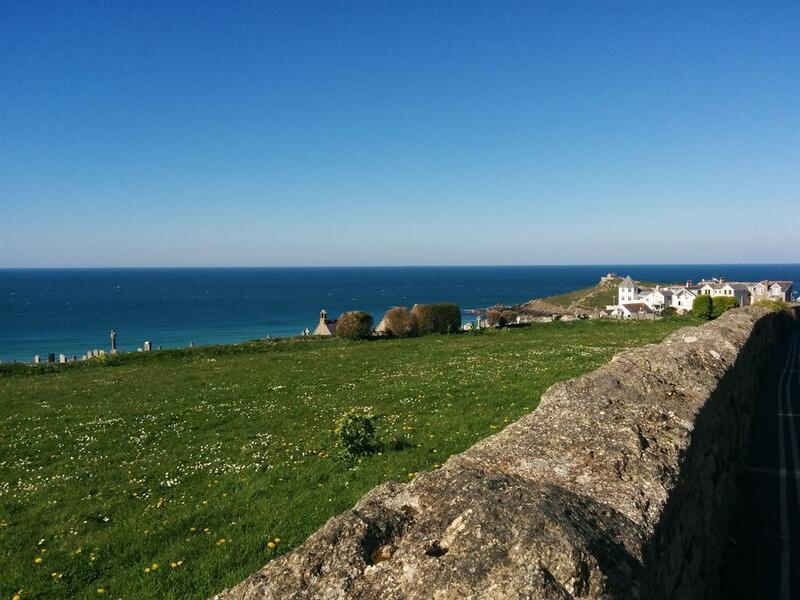 It is also only 5 minutes from the harbour where you are spoilt for choice for restaurants and cafes. 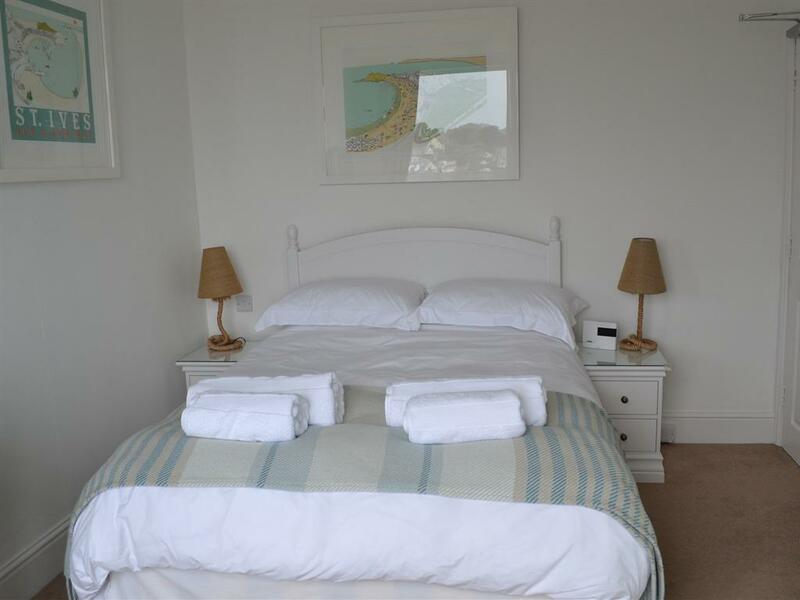 If you appreciate fine art you can also visit the famous Tate Gallery, which is located only a 5 minute walk away from Tregony. 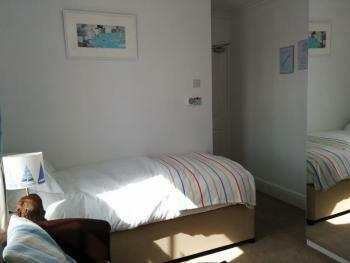 You can also see many pieces of local work in the art galleries located in and around the town centre. 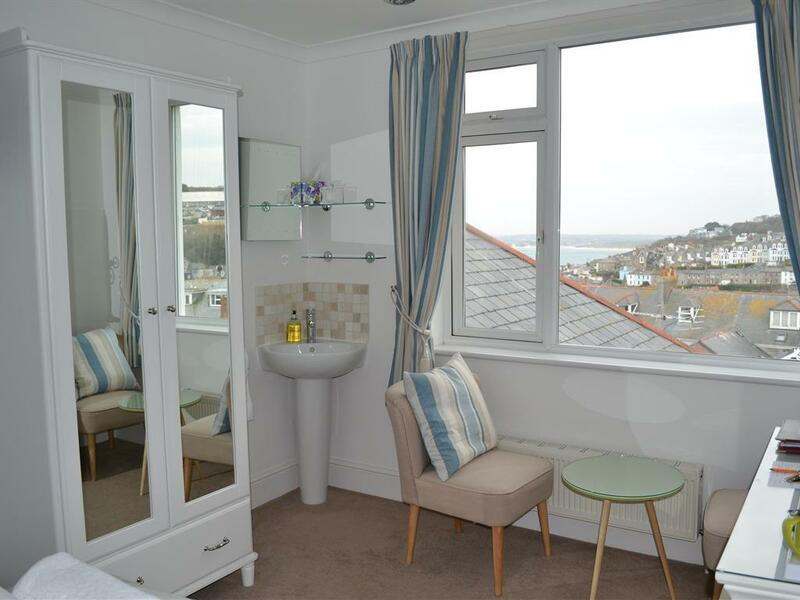 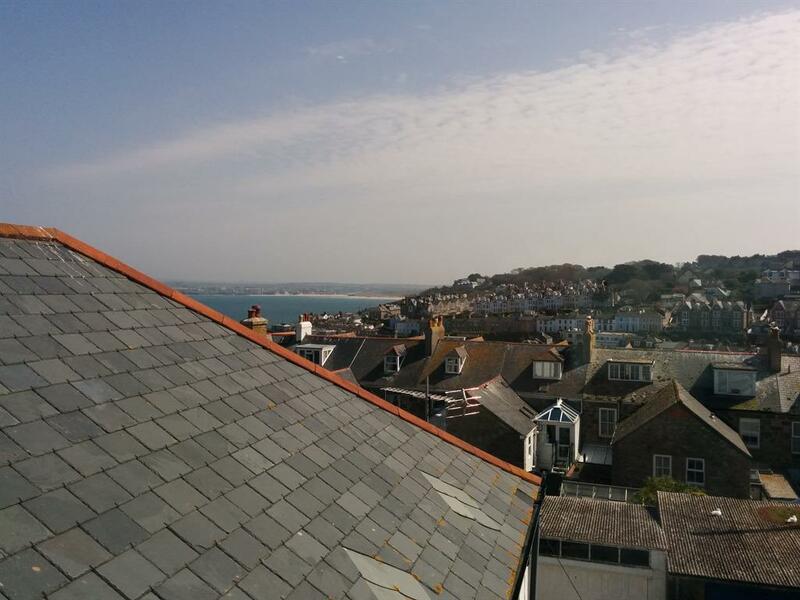 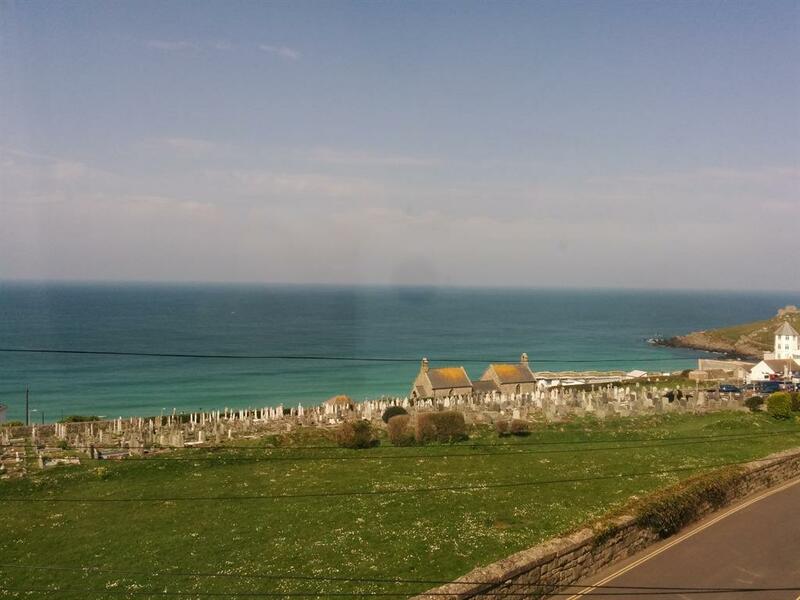 Due to this central location Tregony is close to the beach and harbour and still close to the town centre of St. Ives and the bus/train stations. 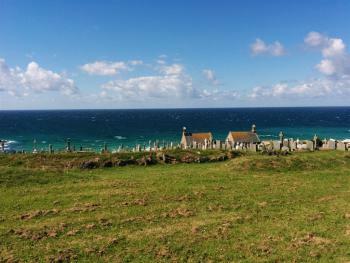 It is an ideal base from which to explore the South West Peninsular. 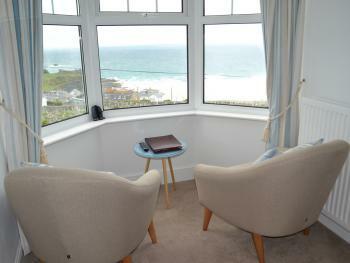 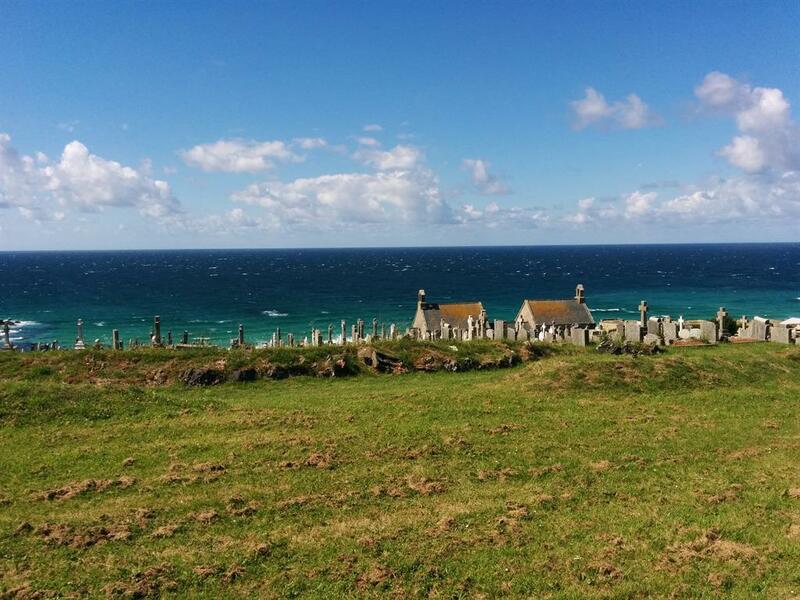 It is just 20 minutes drive from Penzance and 45 minutes drive from Land’s End or The Minack Theatre. The Eden Project, Lost Gardens of Heligan and numerous National Trust properties are also within reasonable driving distance. We have four en-suite rooms to relax in and one room with its own separate private lockable bathroom; each with its own flat screen TV, free wi-fi, tea and coffee making facilities and hairdryers. Then in the morning join us in the dining room for breakfast. Tregony's aim is to make your holiday both pleasurable and memorable by trying to cater for your every need.